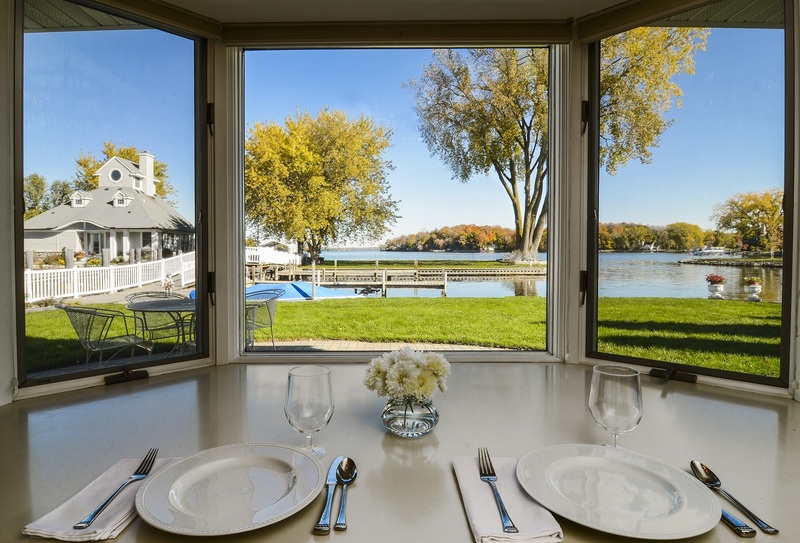 Sunrise at Lafayette is a beautiful lakefront home for sale on Lake Minnetonka’s Lafayette Bay. The two-story Floridian feeling home is located in the city of Tonka Bay in the Minnetonka School Dist. and features 2271 square feet with 3 bedrooms on the upper level and 2.5 baths. The highlight of the upper level is the relaxing master suite. The master suite is just over 700 square feet which includes a personal sitting area, a sun room and an updated full master bath with separate shower featuring heated marble floors. The tranquil views from the wall of windows in the master retreat looking out to Lafayette Bay and Big Island provide a private backdrop. The main level is complete with formal dining, a quaint kitchen, with breakfast table that looks out to the lake through one of the three large bay windows and a spacious living room with a gas log fireplace that is perfect for those cozy evenings. Every room in the home is flooded with natural light. The design of the home provides complete privacy from the nieghbors while maximizing the unmatched views of Lake Minnetonka. The .55 acre lot is one of a kind on Lake Minnetonka as the home has protected water on both the front and back of the home. Think inter-coastal on one and ocean front on the other. The protected harbors mean never having to pull the three 28’ to 32’ docks in the fall or install in the spring. Along the 2 permanent docks in the lagoon is the trestle bridge that spans across the lagoon to the island, which is also part of the lot. Protecting the lagoon is steel seawall, common in Florida but not on Lake Minnetonka with the exception of a few channels and bridges around the lake. The seawall also allows the lush yard to grow up against the water’s edge while preventing erosion. Grandfathered in, the home sits a short 40 feet back from the water’s edge and gibves the impression of the home floating on water. For additional information about the home or to see the home in person click on the address, 35 Fairhope Avenue Tonka Bay MN 55331, MLS #4571642 or call Paul Johnson, the listing agent, with RE/MAX Results at 952.212.7103.